If you are looking for a bit more information and need a technical reference, AllPoints has that for you. Click on a letter to take you to the list of terms and technical information starting with that letter. An electric current that reverses directions at regularly occurring intervals. A unit of flow of electrical current. The rotating part of a motor or the moving part of a contactor or relay. Two dissimilar types of metal fastened together, when heated they bend which can open or close a circuit. A small flow of gas that assists a diaphragm of a bleed gas valve to operate. An electric, gas or steam hot water booster for a commercial dishwasher that will supply 180 degrees F minimum rinse water. Formula to size an electric booster. G.P.H. / 10 = KW based on 40 degrees F temperature rise. The heat required to raise the temperature of one pound of water by one degree Fahrenheit. One BTU per minute = 17.58 watts. A small passageway machined in a valve to allow gas or water to bypass around a closed valve. An electrical device to store electrical energy, block the flow of dc current, and to act as a conductor of AC current. A hollow tube used to allow a liquid or gas to flow in a temperature control. Measurement of air volume by an air handling device. A control valve that consists of some or all of the following: manual valve, automatic safety shutoff, main actuator valve, pressure regulator and pilot adjuster. A continuous path for the flow of electricity. The flow of electricity, measured in amperes. A steady flow of electrical current in one direction only. Part of a thermostat consisting of a sensing bulb, hollow capillary tube and a bellows. This sealed system is filled with a fluid which expands when heated to actuate electrical contacts. The difference between the on and off temperatures of an operating thermostat. Two high voltage electrodes create a continuous spark to ignite a main burner. 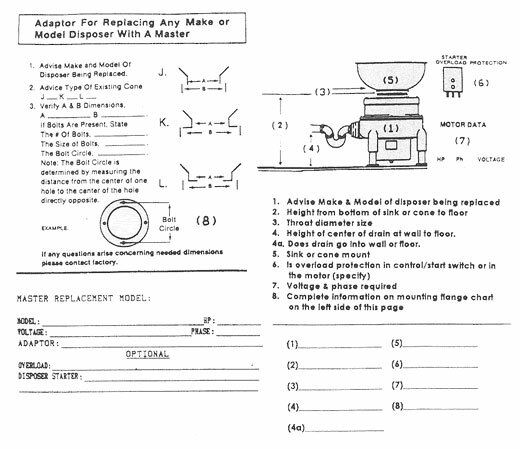 Master disposer replacement work sheet. A switch device that opens or closes connections in two conductors of the same circuit. A switch that opens or closes connections alternately in two conductors of the same circuit. A switch that opens or closes connections at one position in two conductors of the same circuit. Temperature scale, 32Â°F being the freezing point and 212 Â°F being the boiling point of water. A coil of insulated wire wrapped around an iron core. When electric current flows through the coil, a magnetic field is produced. Used in motors in conjunction with an armature. Please click here for chart. A coil of fine wire which when heated by an electrical current glows and is used to light a pilot flame. The measurement of the flow of a volume of liquid. To convert GPH to GPM divide by 60. A resistive element is used to heat and ignite a gas burner. One horsepower = 2544 B.T.U. per HR. Frequency of ac power in cycles per second. Usually 60 HZ in USA and 50 HZ overseas. A measurement of gas pressure, one inch of water column equals 0.036 psi. 28 inches of water column equals 1 psi. Heat is produced by a glowing burner surface which radiates infrared energy. Pilot flame ignites only when main gas burner is to be ignited. A burner in which gas and air mixtures combine in air above the burner ports to burn. One kW equals 1,000 watts. The amount of energy one kilowatt produces in one hour. One kilowatt hour = 3412 Btu Per hour. The voltage level of the main power supply. Electrical power consumed by components of an electrical circuit. Instrument for the measure of gas pressure in inches of water column. 1 /1000 of an ampere. A thermocouple and pilot combines in one device. Gas extracted from the earth. Normally Closed A switch or other device which is in the closed position when not energized or activated. Normally Open A switch or other device which is in the open position when not energized or activated. 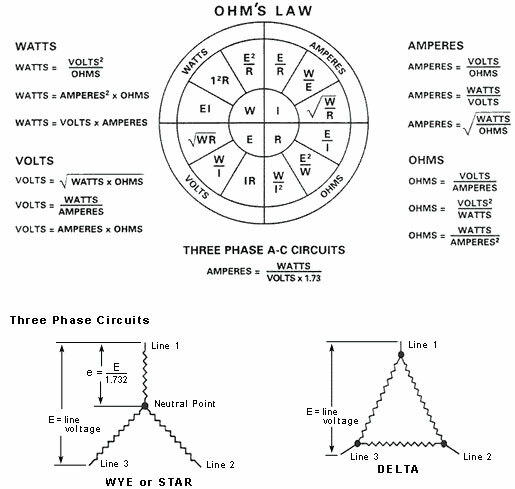 The resistance which will allow one ampere of current to flow when the voltage is one Volt. 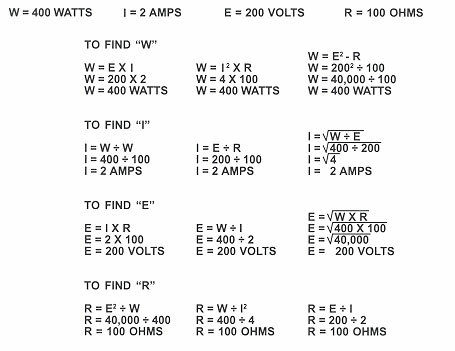 Equations of relationship of voltage, current, and resistance. An electrical circuit through which a current can not flow because of an open switch or other break in the wiring. An electrical circuit in which more than one path is provided for the current flow. A valve of which closes when pilot flame does not exist, valve automatically stops the flow of gas to the pilot and main burners. The decrease in gas pressure as gas passes through a control or piping. The high voltage side of a step-down transformer. A mechanical valve that reduces the incoming pressure of air, water or steam to a Lower set pressure. An electromagnet device used in a control circuit to provide electric current to a valve or switch. Referred to as a start relay when used for a motor. A device to limit the current flow in a circuit. A type of resistor where the resistance can be adjusted to various levels. Low voltage side of a step down transformer. An electrical circuit in which only one continuous path is provided for the flow of current, so that the current flows through all components in the circuit. A wire wound coil that creates a magnetic field when energized. A valve operated by a solenoid coil. Semiconductor type switching device with no moving parts to control an electrical circuit. A switch device that opens or closes connections in a single conductor. Single Pole, Double Throw A switch that opens or closes connections at one position in a circuit. Single Pole, Single Throw A switch that opens or closes connections at one position in a circuit. Pilot flame remains lit whether main burner is off or on. A device which trips an internal switch to interrupt electrical current to protect against an over current condition. A device containing two different metals which produces a small amount of DC voltage when heated. Operates a pilot safety valve. A group of thermocouples contained in one unit, when heated by a pilot flame millivolts are generated to energize a pilot safety valve or power a millivolt operated control. An automatic device actuated by temperature changes to control a preset operating temperature. A device for changing one voltage to another voltage. A pilot ignition system that uses a small standing pilot flame to light a larger pilot. A pressure lower than atmospheric pressure. A piece of pipe that attaches to a burner. Because it narrows down then flares out it Increases gas velocity to create a negative pressure for combustion. The force of electric current through a circuit. One gallon of water = 8.34 lbs. One Cubic Foot of Water = 62.4lbs. One Cubic Foot of Water = 7.38 gallons. One gallon of water = 231 cubic inches.